Member Exclusive! 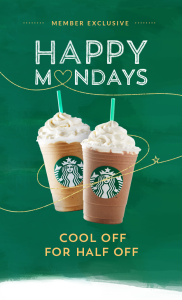 Half-price frappuccinos after 2 PM today only! Check back every Monday for special member-only deals they’re running all month long! When they had the BOGO deal, mobile ordering worked. I’d give it a shot for these half price fraps too. Why wait in line when you don’t have to?! Expired: Crazy 8: $8.88 Jeans Last Day!